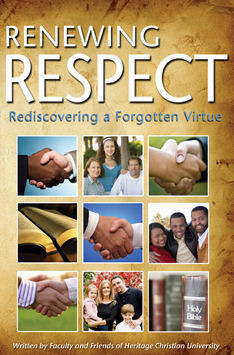 For a limited time (through 10/26/2013), Renewing Respect: Rediscovering a Forgotten Virtue is available from the Gospel Advocate online store for only $3.99 (Reg $8.99). Simply enter the promo code (P002) at checkout to receive this special offer (applies to first 50 redemptions). Some things cannot be overdone. You cannot pray too much, draw too near to God and respect too much. We live in a time of eroding respect. God, the Bible, religious leaders, the church and the family unit were once treated with honor. Now they are often disregarded or even ridiculed, victims of selfishness and misplaced faith. It is against this current that God’s people need to maintain their respect for the living God and His living Word. In Renewing Respect: Rediscovering a Forgotten Virtue, twelve writers associated with Heritage Christian University share perspectives on the significance of respect and what we can do to rebuild it. Each author focuses on the need to restore respect in one area, such as leadership, preaching, the Holy Spirit, grace and the family. As they explore this often forgotten virtue, they will inspire you to examine your own value system and to receive the blessings of renewing respect.